3. Import the sounds/dictionary into Dynamic Spelling Bee using the Import dictionary wizard. b. 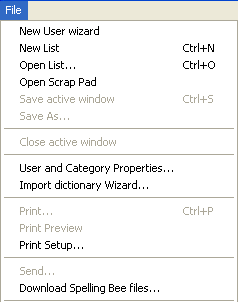 Select and click a dictionary sound package which will start the download to your computer. The files are a patch install and will not uninstall. When you are happy you have imported the sound dictionary correctly just delete the import folders or back them up to a CD. a. Double click the installation setup file to start the installation. b. You will be offered "C:\Program Files\Dynamic Spelling Bee" as the default path. Change this to where you actually installed Dynamic Spelling Bee. c. You will be warned that the directory already exists and do you want to install to that directory anyway. Dynamic Spelling Bee should exist so click the Yes button to continue. d. The package will be installed in Dynamic Spelling Bee's importdr directory under its package name dsbdic01, dsbdic02 etc. Inside the directory you should have a configuration file, import dictionary and waveform folder containing the waveforms. e. You are now ready to import the sounds/dictionary into Dynamic Spelling Bee. a. Run Dynamic Spelling Bee. c. The first page requires you to select the actual dictionary package you want to import. Click the Next button. d. The second page will display the name of the import dictionary category. From the drop down list box select the dictionary category you wish to import into. This can be a Free category. If your choice is a Free category it will take the name of the import dictionary category even if no words are transferred over. Click the Next button. Fig. 2 Selecting the dictionary category you wish to transfer to. e. The third page lets you transfer the words/sounds into your spelling dictionary. Click the Start Import transfer button to move the words/sounds into the spelling dictionary. e1. If you do not want the imported words to disturb your words present dictionary categories click the No radio button. e2. If you do not want the imported sounds to overwrite your current sounds select the No radio button. Fig. 3 Selecting the dictionary category you wish to transfer to. f. When the transfer is complete the totals will be shown in a message box. Words transferred from one dictionary category to another will be shown as part of the "Already in" total. Click the Finish button to leave the wizard. Send an Email to with questions or comments about this web site.